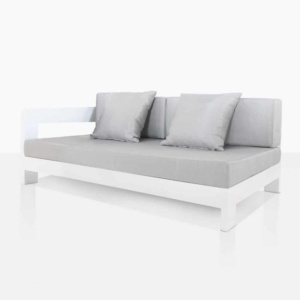 Resplendent and chic, the Amalfi Aluminium Collection in White is making impact as an alluring, sophisticated sectional that gives you many options for creation. 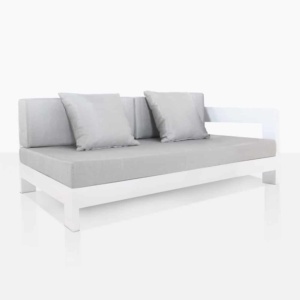 Bringing your outdoor area into a sense of well being and ease, the Amalfi Aluminium Deep Seating Collection is a masterful example of style and comfort. Radiating sophistication, this sleek, chic collection is versatile and luxurious, bringing what it really means to live in the open air to new life. The most upmarket sectional, the Amalfi Aluminium Collection boasts 7 incredible pieces, the Left and Right Daybeds, Corner Piece, Center, Chair, and Coffee Table – which could double as an Ottoman. The options are endless! You can create many different shapes and styles depending on your space and the look you want to create. The Amalfi Aluminium Collection cuts a dashing profile, with low, slender frame of powder-coated aluminium in either white or charcoal. 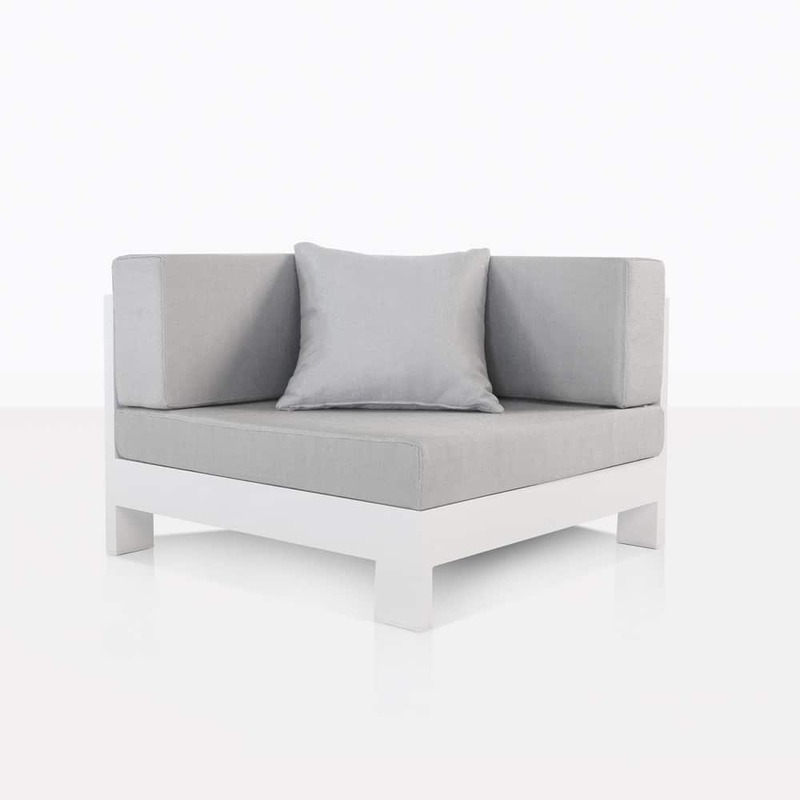 A beautiful minimalistic approach that means when sectional pieces are added together, the look is seamless and very attractive. 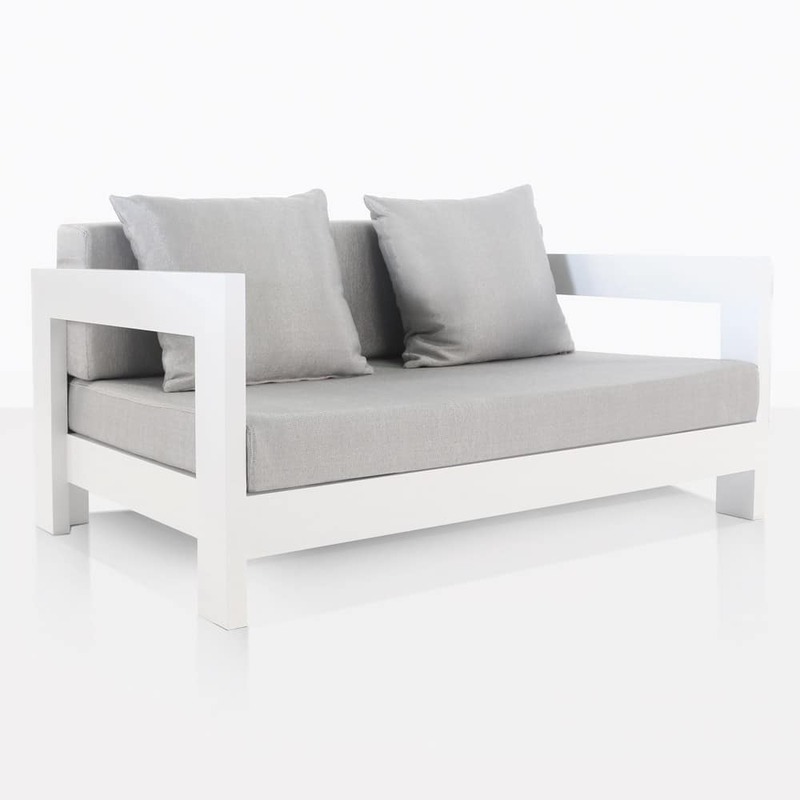 Elegantly contrasting with the slim frame is thick, eye catching outdoor cushions that are boxy, fashionable and fabulously comfortable. 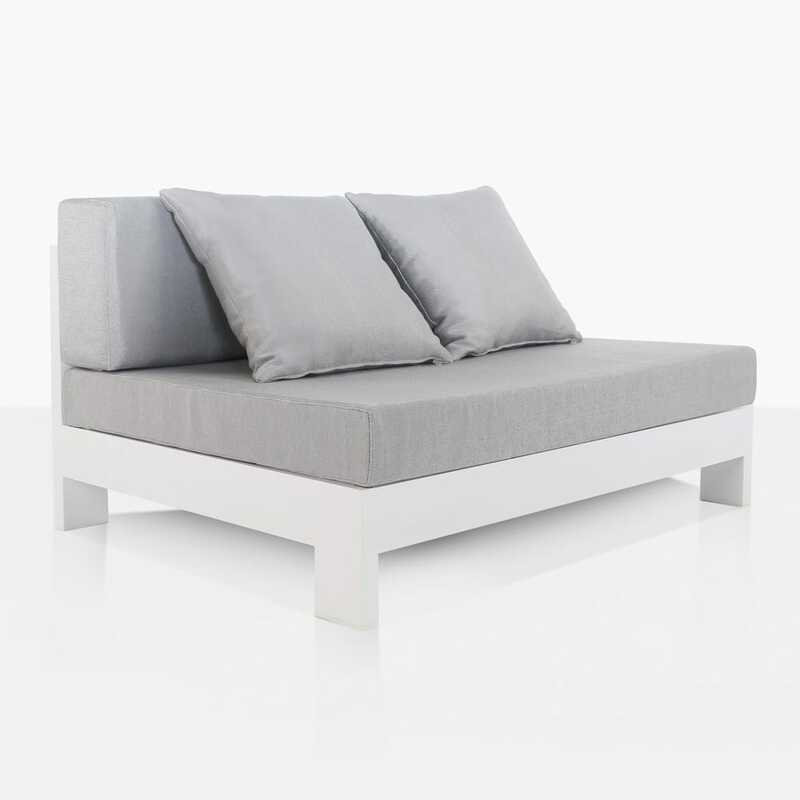 Curate a welcoming, tasteful L shape in your backyard with two of the Amalfi Aluminium Daybeds with a Corner piece. Place the excellent Amalfi Coffee Table in the centre and you have an instant communal area that is brimming with style. Perhaps you have a smaller space asking for a simple feature to bring it into contemporary style. Purchase a simple Amalfi Aluminium Center piece and frame it each side with a glorious, attractive side table of your choosing! The Amalfi Aluminium Collection is founded on style, luxury and quality. The frame is protected by powder coating, which looks sharp but also adds extra resistance to the harsh elements. Our outdoor cushions are UV treated so you know that you have got a marvellous product that will stand the test of time in the great outdoors. 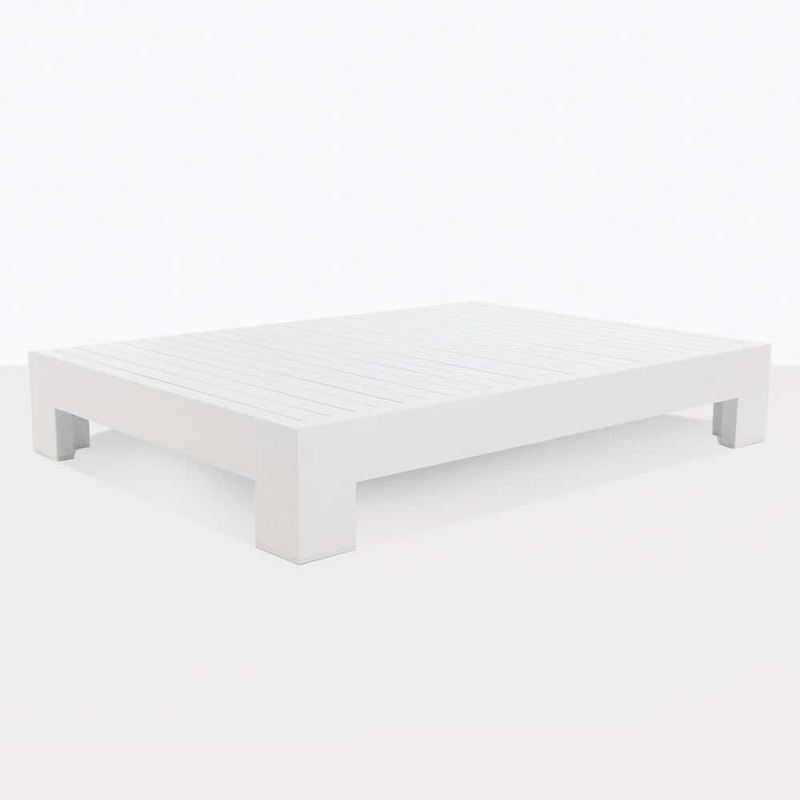 To order your Amalfi White Aluminium Collection, call us today! There’s no time like the present!